Aaron James is one of the top mainstream comedians in the UK today. 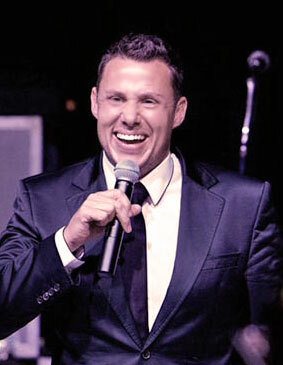 He has many strings to his bow being an impressionist, host, auctioneer and presenter with an ability to work any type of event and make it fun-filled. Providing pre-match entertainment at Manchester United, Chelsea, Leicester city and many more aswell as numerous champions league finals all over the world, and World Cup finals. Golf days for Aston Martin, Porsche, Virgin Atlantic, British Airways and many more. We’ve had the great pleasure of Aaron’s excellently hilarious entertainment for the last five-years at the Virgin Atlantic golf day. He is simply brilliant. Cheeky, funny and wildly witty! Created a great atmosphere and a complete crowd-favourite. He did a great job of promoting our charities, raising funds and leaving everyone wanting more. I’ve delayed writing to you because I’ve had a busy weekend at the Golf Club and of course one of the hot topics was the Men’s Dinner- and how, by common consent, it was the best in years. And that was down to you. Thank you so much. I have not heard one word of criticism, only praise. And that from guys who I know can be particularly curmudgeonly! !So, a big personal thanks from me for your hard work on the night- you are an excellent comedian (the best in your price bracket!!!) without the need to resort to jokes which nowadays cause eyebrows to be raised- or worse. Fantastic job! Have a great week. What can I say? Absolutely brilliant – polished, professional and had our Membership in hysterics – congratulations! Feedback has been wonderful and I stand by my wager that if you do not get at least two referral pieces of business from last night, then my golf hat gets eaten. You got the mood of the room very quickly and went on from there – including dealing with our “sleeper cell” superbly. Well done – we will see each other again before too long and please take us up on our invitation to play at SGHGC. It really is quite special! After hosting our corporate golf day a number of times we knew you were the perfect choice for our national conference, you did not disappoint!